You might say this is Lyle's 45-year itch. He says the last time he built a racecar model like this was around 1964. Best known for his street rods, customs, and muscle cars, Lyle likes to do something out of the ordinary once in a while -- a great while. This extraordinary B/Gasser is based on the all-new Revell 1957 Chevrolet 150 Sedan (Black Widow) kit. 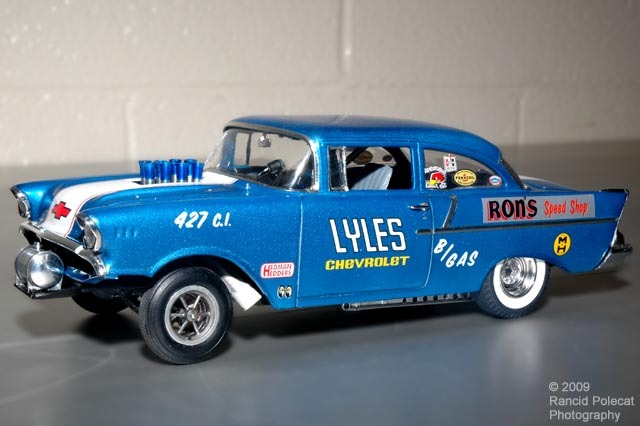 To assure his model would be accurate, Lyle followed a 1965 NHRA gas class rule book to determine all the necessary "legal' parts and modifications, as well as to determine the class (B).